Rent it for $100/day ………………………………………. This new style aerator plunges tines into the ground using a crankshaft style axle, allowing the tines to be directed with force than traditional aerators. The result is an aerator that works well not only in soft soil, but also hard packed or dry lawns. The PL2500SPH Self-Propelled Hydro-Drive aerator delivers up to 35,000 sq. 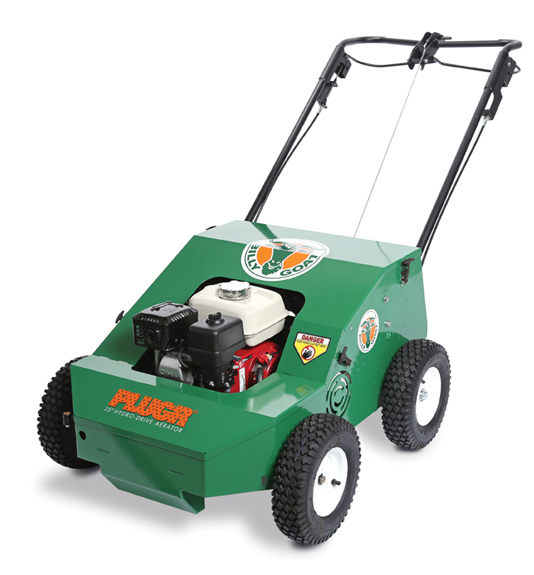 ft. of aeration per hour and punches core depths to 2.75″ even in hard soil conditions. It has a top speed of 2.62 mph or 3.846 feet per second. Eight reciprocating cam driven tines propel the unit forward and variable speed hydro-drive allows for denser hole pattern at slower speed where needed, plus eliminates fatigue from pushing while transporting or ramp loading and provides commercial operators with enhanced control while aerating on hilly areas.